After an improving performance last Saturday against MK Dons, attention is back at The People’s Pension Stadium as we host Grimsby Town. Despite not quite getting a result last week it was a much improved performance from Reds after a few flat performances in previous weeks. The issue was once again hitting the back of the net however, the Reds did come close with George Francomb’s effort hitting the crossbar and Ollie Palmer missing a one on one. Just three goals in eight games is not good enough and the Reds need to find a way to score goals or will find themselves in serious danger. 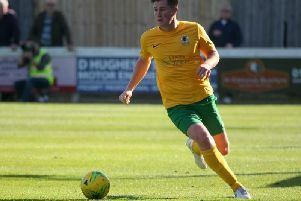 On the other hand, the defence has found a very solid partnership between George Francomb, Joe McNerney and Tom Dallison at the back but a couple moments of losing concentration is what has caught the Reds out in recent weeks. Another player who has strengthened the side is Matty Willock. The Manchester United midfielder has made a big impact on the team when starting, driving at the opposition defence looking to create chances. Another player doing a similar job is David Sesay at left-wing-back, who has put in good performances consistently and always looks a threat down the left flank. It’s just chances that need to be changed into goals for the Reds, but this won’t be easy against a very strong Grimsby side. Prior to last Saturday Grimsby were on a very good run of five games undefeated but were condemned to a 2-0 defeat at home to Cambridge United on Saturday. There’s a familiar face for Grimsby as former Reds striker Wes Thomas has been doing the business for Grimsby as he sits on 10 league goals, just one behind Reds top scorer Ollie Palmer. Thomas will be a big threat for the Reds defence and the defenders will have to keep a sharp eye on him as he could be very dangerous. Grimsby also have a very good goalkeeper in James McKeown who has proven himself many times this season with crucial saves for the Mariners. Cioffi’s men need to start picking up points rapidly as if the teams below them proceed to pick up points the Reds could find themselves in a serious relegation scrap. Two home games in a row could provide a perfect opportunity for this but neither game will be an easy encounter. Let’s hope we can pick up all three points against a strong Grimsby side.